Thanks for the comments guys. 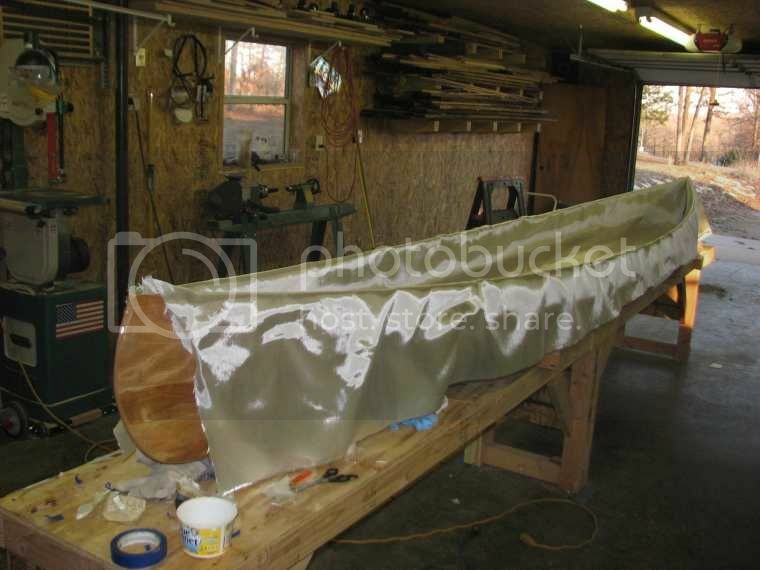 I think it's safe to say I have been taking my time with this canoe. I have wanted it since Mick built his, but I didn't have a place to build anything this long. 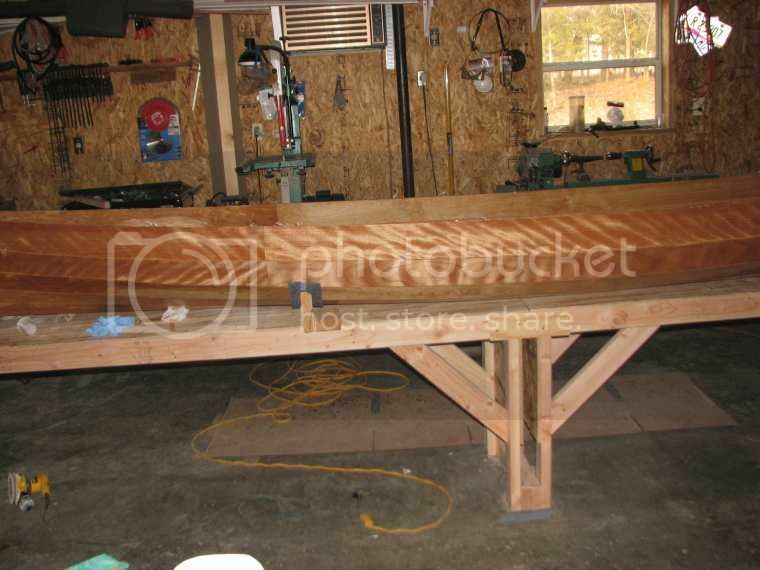 I bought the plans in 2008, the plywood in 2009, the house and shop in 2012, and finally started in 2014. It might not be safe to move any slower, the buzzards have already been circling the shop! I still have not decided on what I want to use on the bottom. 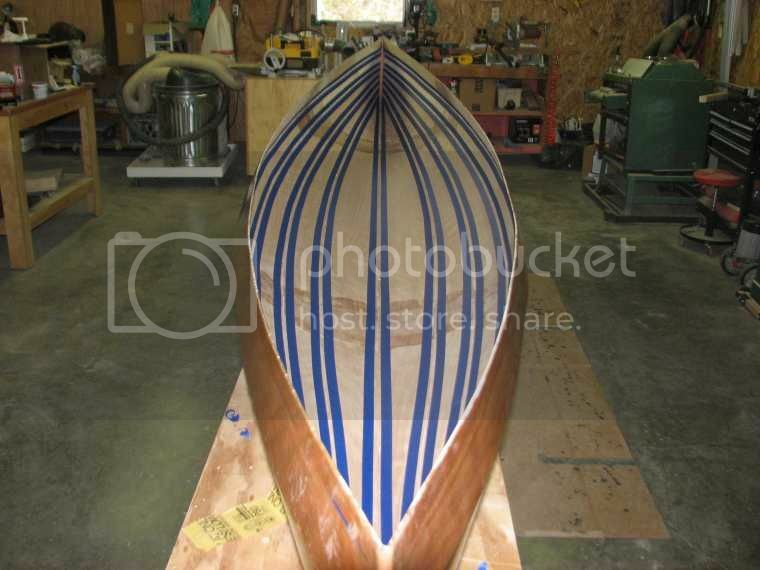 I used graphite on my other boats, but I really like the looks of the paint that Chuck used. I will be hauling it on my truck in the summer, and the paint would definitely be cooler. On the other hand, Mick has hauled his around in probably higher temperatures than here with no apparent problems. Anyway, I have lot's of time before I have to decide. At least it's finally starting to feel a little like spring here. The ground has been white most of the winter. Well, the weather has been a lot better here recently, so I was able to get a little more done. Turned over and ready for the inside fillets. Lots of blue tape. I used scraps of cloth to do each end. The weather has been in the 60's and lower 70's, so I decided to do the whole inside with one piece of cloth. It worked out pretty well. These cooler temperatures gave me plenty of time to get it all done with no rush. I am happy with the way it came out. Not being rushed to get it done before the epoxy sets up really made it nice. 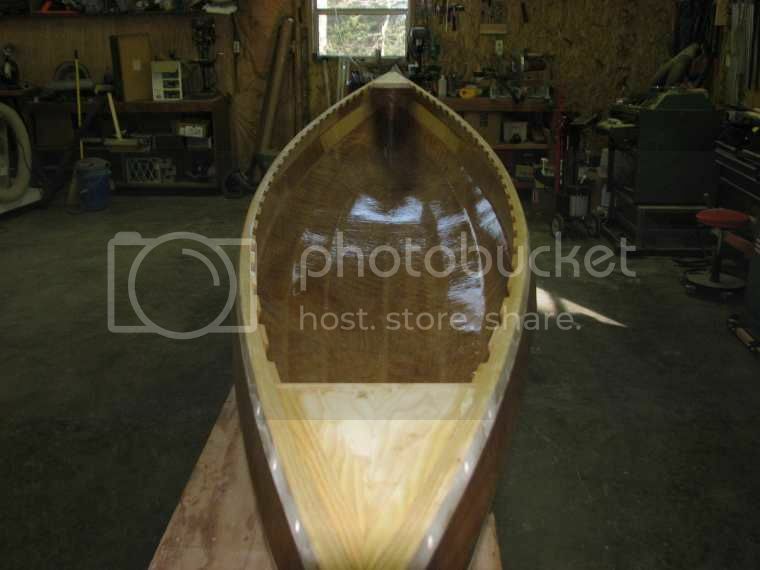 I am trying to decide on what to use for the gunwales and trim. I have some pretty nice ash, so I will probably use it. It will have to scarfed to make it long enough. I considered black walnut, since I have a lot of it, but will probably use the ash. Either one will have to be scarfed to be long enough. The ash will be lighter colored than the plywood, but I think the walnut would be too dark. 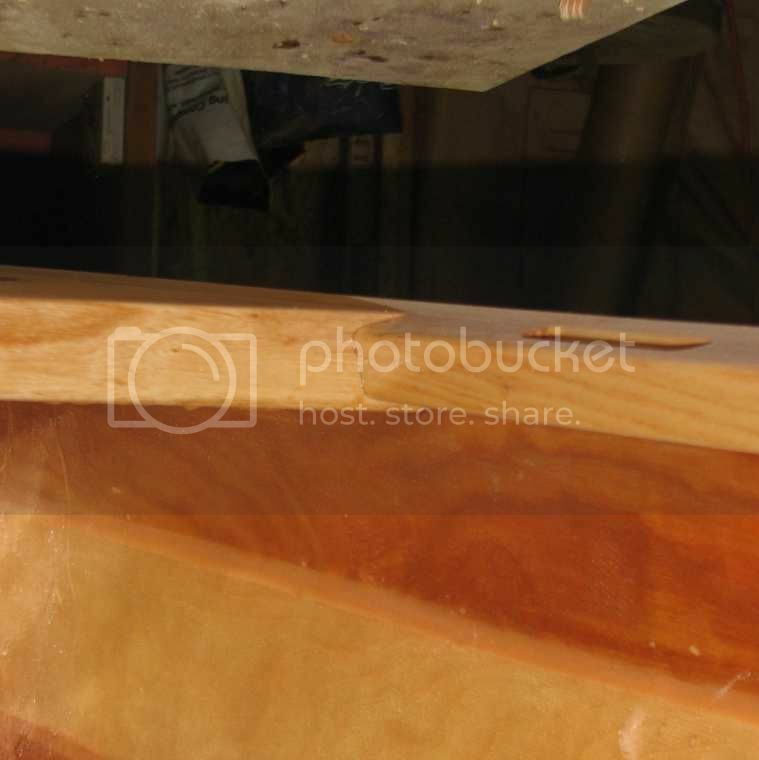 Walnut has always been my favorite wood to work with, but maybe not on this canoe. I'm impressed that you did the inside wet out in one go - good job. At this rate you should beat the buzzards easily . Are you going to do scuppered inwales? I think maybe I have been moving fast enough at least to discourage the buzzards. I will definately be using scuppered inwales. I am still working out the details, but I have some quality ash lumber that I think will look good. I have been cutting and planing it today, and hope to get it scarfed together tomorrow. 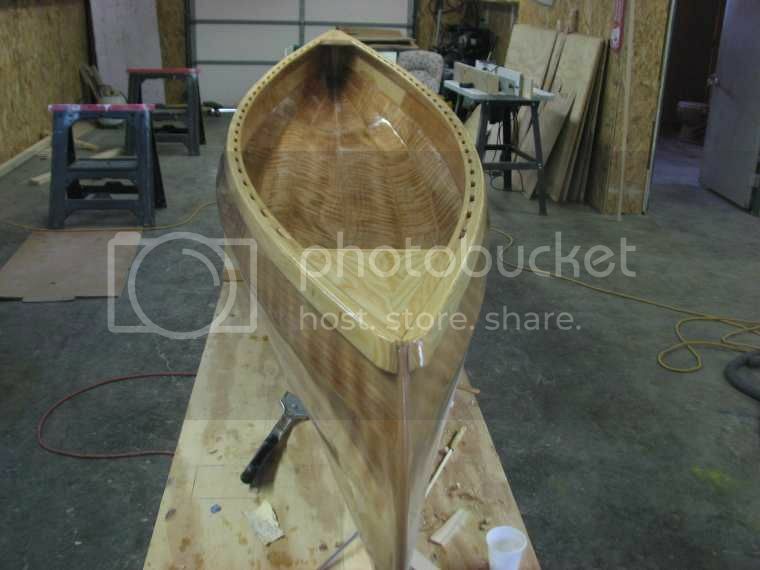 It's really starting to look like a canoe. The weather has warmed up enough to get a little more done. I have been having to heat the shop to allow the epoxy to cure properly. I'm glad winter is almost over, I am out of firewood. My wife told me I needed to clean the shop before I posted any more pictures. But then she stayed and helped me clean it up, so I can't complain. She has helped me a lot on this build. 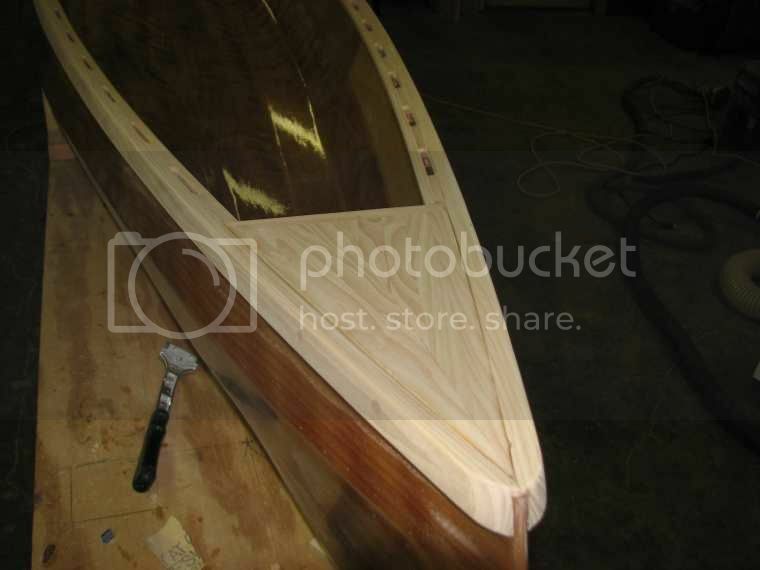 The ash gunwales were pretty stiff and hard to bend and clamp in place, and I'm not really sure I could have done it without help. 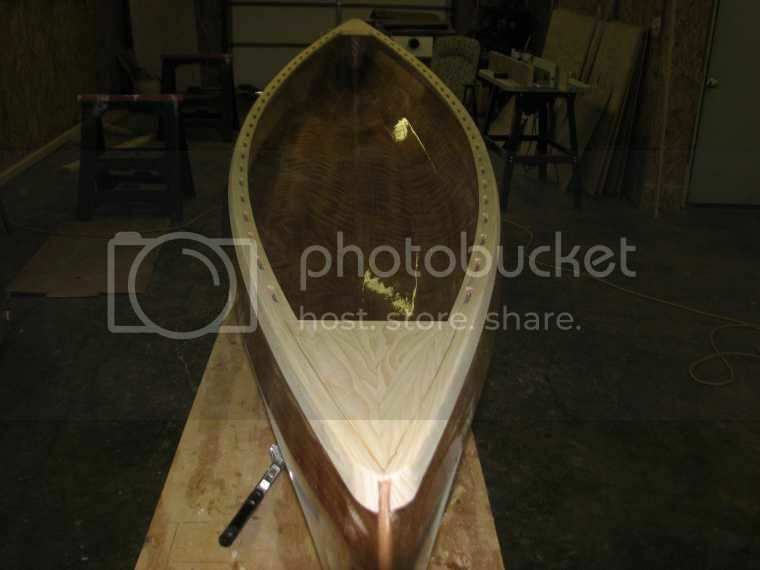 She is looking forward to us using this canoe. 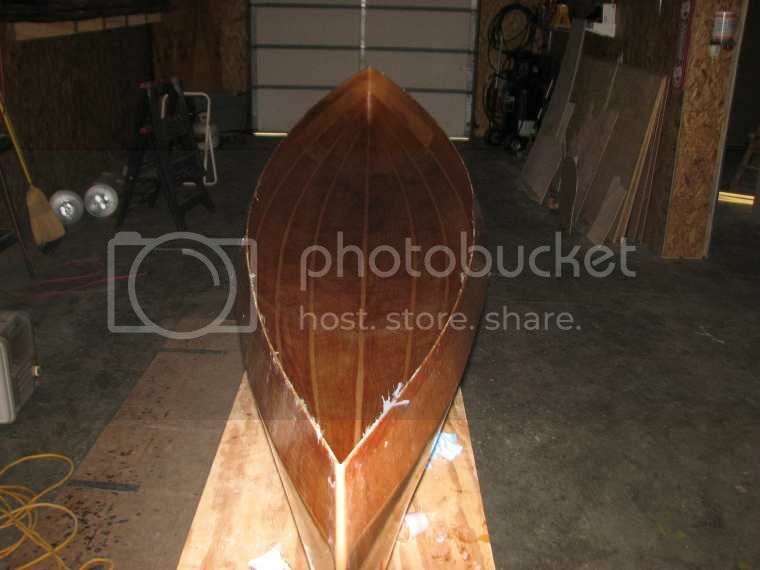 I got the outer gunwales on. 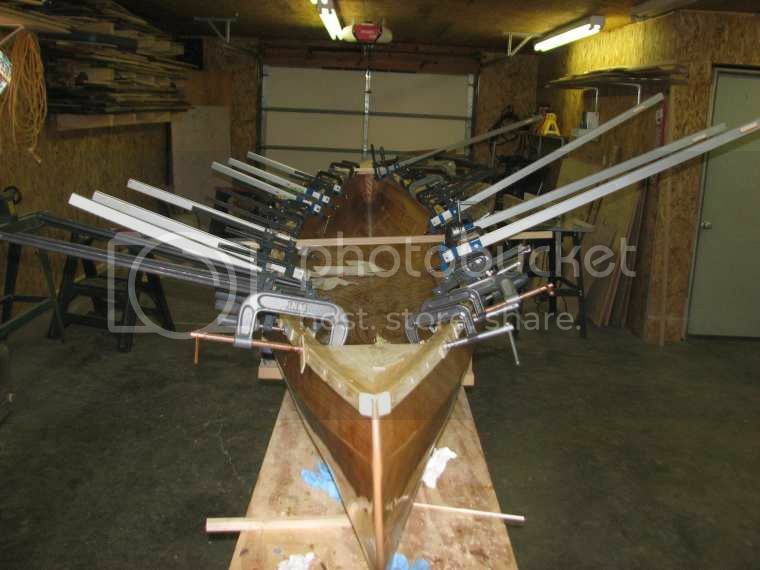 My clamp collection holding the inner gunwales. All glued up and ready for sanding. A coat of epoxy on the ash. The ash is a little lighter colored than I really wanted, but I like how it looks. It seems a little heavy, but it is strong. It is some material I bought about twenty five years ago for a furniture project that never happened. It finally is getting put to good use. Stunningly good work there Terry. You've really made good use of the timbers. Are your inner gunnels under the breasthooks/decks, or flush with them? Looks like flush but I couldn't see for sure. 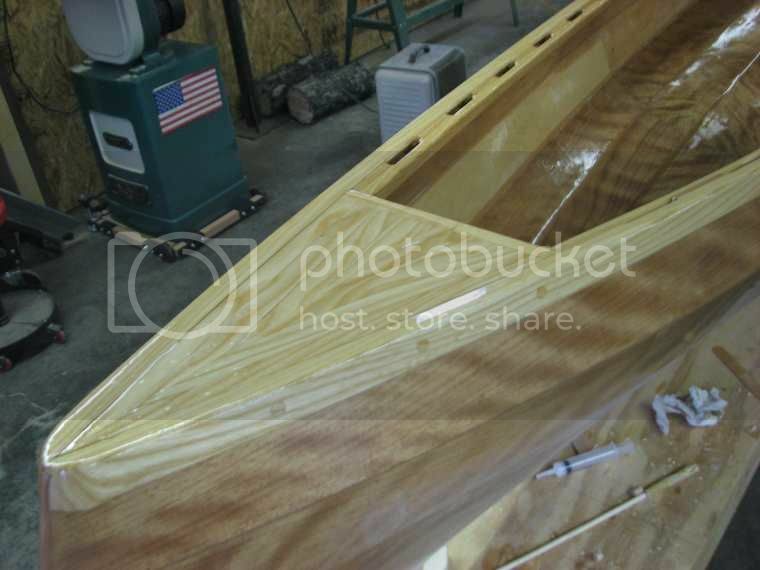 Les , The top panel of this canoe is on a pretty good angle. 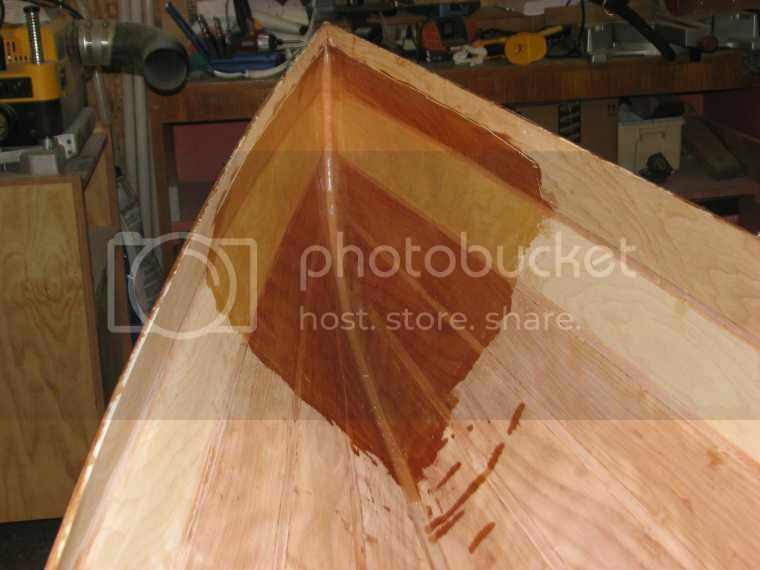 Both gunwales are flat against the plywood panel. This picture should show what I mean. The canoe is upside down right now while I work on the bottom, but I held the camera upside down under it to get this picture. Beautiful job Terry. That boat will turn some heads.